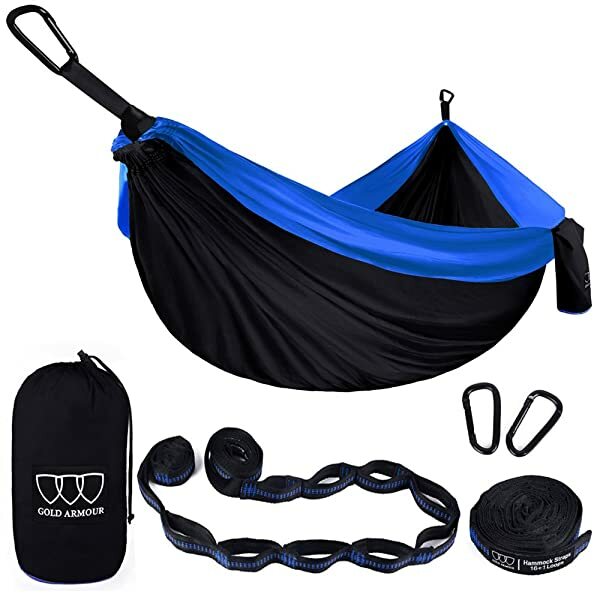 If you are looking for that perfect double hammock for use in your camping and backpacking trips or even for relaxing on the beach or your backyard, Winner Outfitters has just the right one for you. It is an affordable product that is very spacious when you set up and will withstand up to 500 pounds to make it ideal for sharing. Versatile hammocks that you can use for everything from camping to backyard relaxation. It is easy to set up, and it should take less than three minutes to do it. The lightweight design makes it convenient and easy to transport. This hammock will support up to 500 pounds which makes it ideal for sharing. Nylon parachute construction makes it very durable. You get everything that you need to use it on your purchase including the carabiners. It is quite affordable for a double hammock. It would be better with more color options. Steel carabiners are a little on the heavy side. The straps would be better if they were a little longer than they are and their quality also needs some improvement. 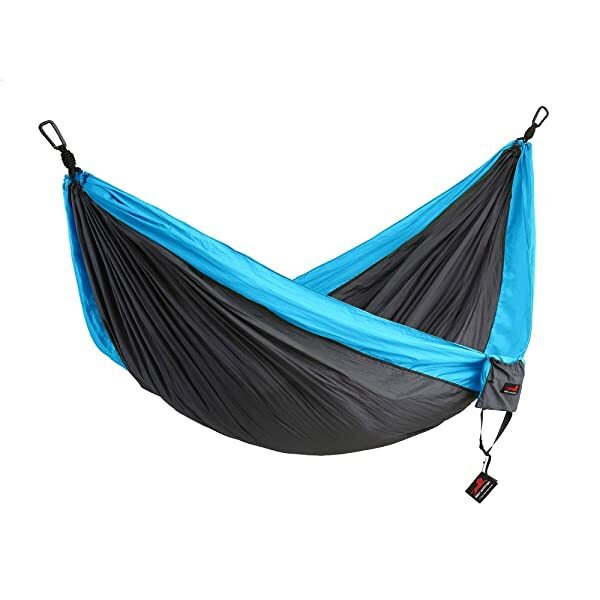 If you are looking for that perfect double hammock for use in your camping and backpacking trips or even for relaxing on the beach or your backyard, Winner Outfitters has just the right one for you. It is an affordable product that is very spacious when you set up and will withstand up to 500 pounds to make it ideal for sharing. The 210T nylon parachute is high-quality, soft and very breathable to ensure maximum comfort and durability. 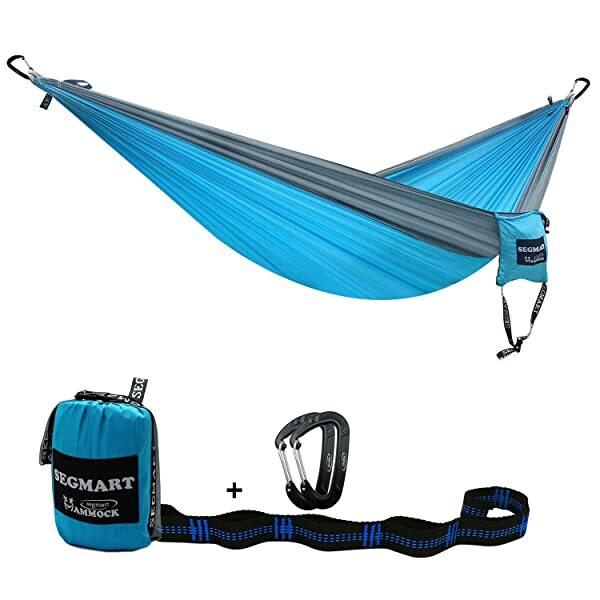 And you will also get everything that you need to use the hammock when you buy it including the carabiners and tree straps. Material: Winner Outfitters makes this double hammock with 210T nylon parachute to make it very long lasting. The fabric is also very breathable, mildew-resistant, soft and with a triple stitching to maximize its strength. Dimensions: The dimensions of this hammock are 118 x 78 inches to make it spacious enough for two adults, and it weighs about 1.5 pounds to make it lightweight for carrying on your camping and backpacking trips. Weight Capacity: This double hammock can withstand up to 500 pounds according to the manufacture and so it will be ideal for sharing. But, the quality of the material and the accessories mean that it can even withstand slightly more weight than this. 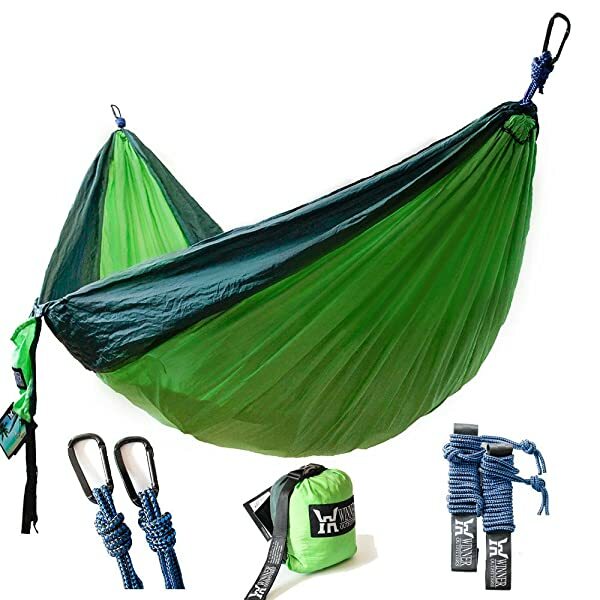 What is In the Box: Besides from the high-quality and attractive hammock with a stuff-sack you will also get some steel carabiners, two ropes that are each 137-inch long and two 52-inch long tree straps. And so you will have everything that you need to use it straight from the box. Double hammocks are always the best when you want something spacious that you can share with someone and if you are looking for a high-quality and affordable one this Winner Outfitters hammock will be a good choice. It features a durable nylon parachute construction that also has all the right features that you can want, and they include breathability and mildew-resistance. And setting it up is also quick and easy since you also get all the things that you will need including the ropes and carabiners. 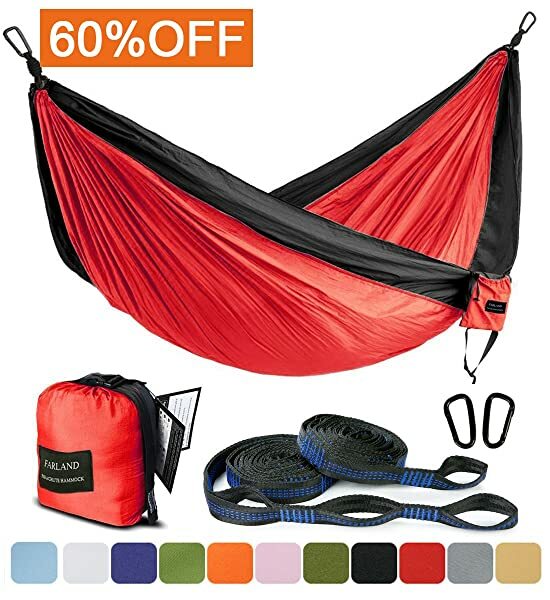 There is almost no shortcoming with this hammock apart from the fact that it is not available in enough color options and the rope quality and length need some improvement. And so the bottom line is that this is a top-notch quality product that will be worth trying out.